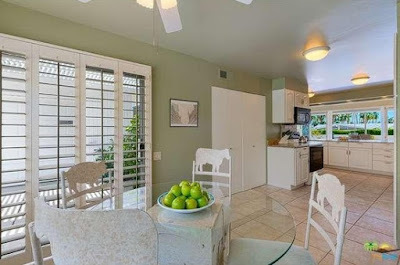 In South Palm Springs sits the mid-century modern condominium development of Canyon View Estates. 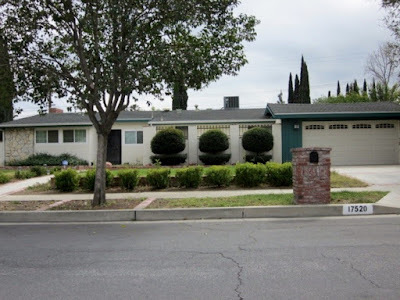 Built between 1961 and 1963, the Canyon View Community houses approximately 160 Krisel-designed condominiums clustered around common greenbelts and offering commanding views of Mt. San Jacinto. Within this development sits this three bedroom, two bathroom, 1,943 square-foot condominium with a two car garage all on a 3,049 square-foot lot, with an asking price of $459,000 and monthly HOA dues of $360. 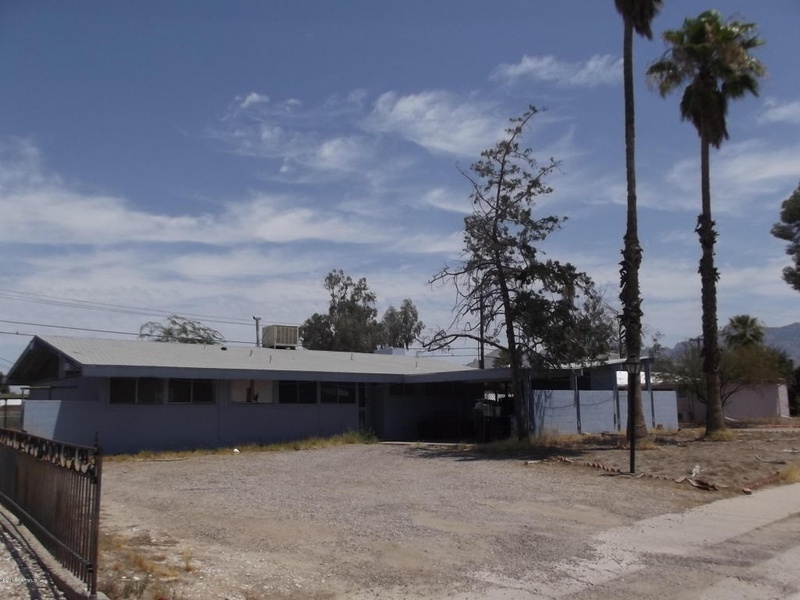 This particular unit was constructed in 1963 by Feybor Inc. and sits behind a privacy wall on South Palm Canyon Drive. 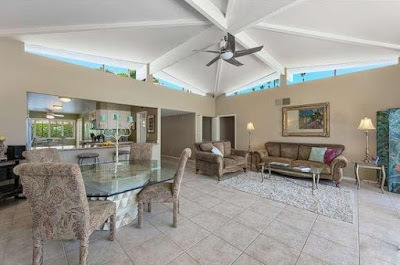 This unit features the signature Canyon View eight-pointed vaulted ceiling in the living room with clerestories offering glimpses of the surrounding mountains and palms. The living & dining rooms face east and access a private walled patio with views of the common greenbelt. 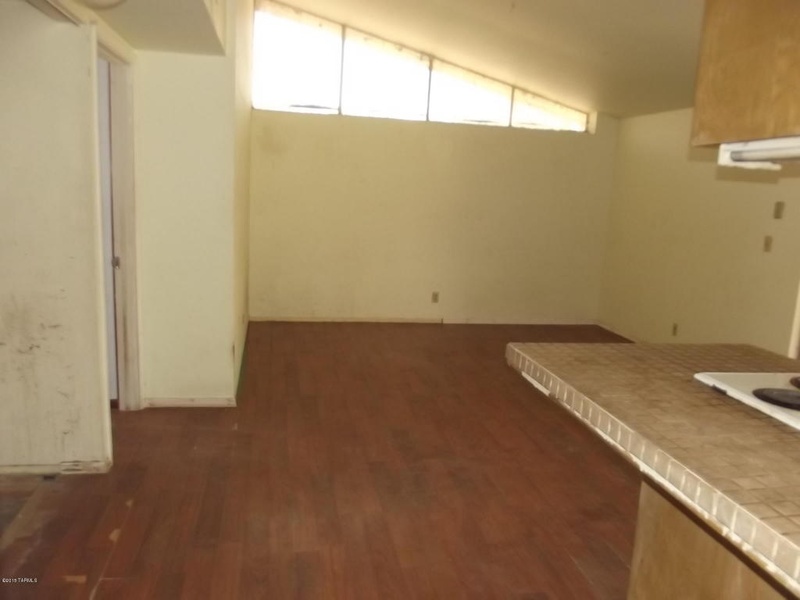 The large kitchen sits at the front of the home, and opens up to the dining room area. 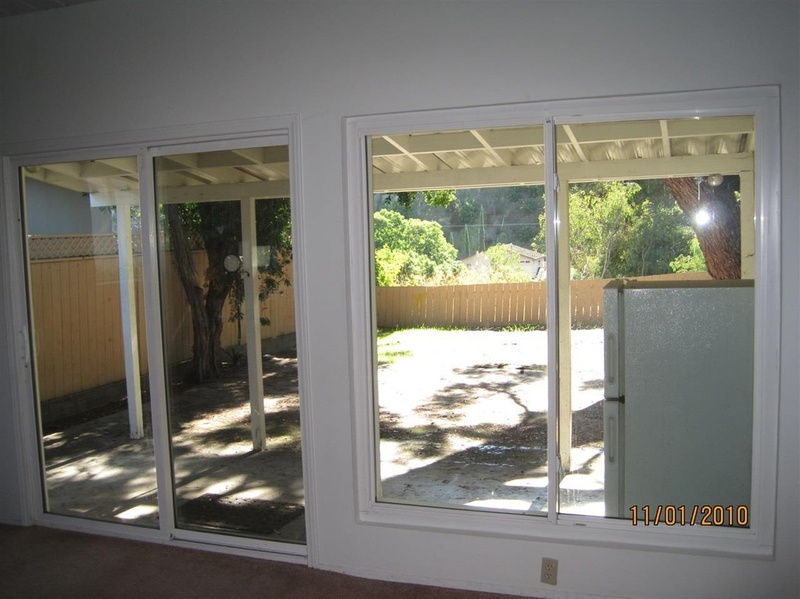 Also provided is a private breakfast nook that features a large sliding glass door just off the entryway. All the cabinetry, counters and appliances have been updated, as have pretty much all features of the home. While more traditional than complimentary of the mid-century modern architecture of the unit, the updates are good-quality, clean and solid. 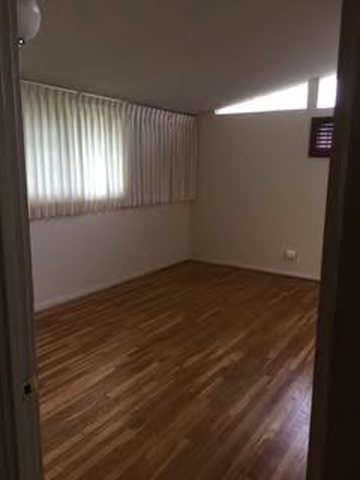 Just off the living room and entry hall sits the third bedroom, which is currently used as a den. There’s a swanky mirrored wet-bar hidden behind one of the closet doors. 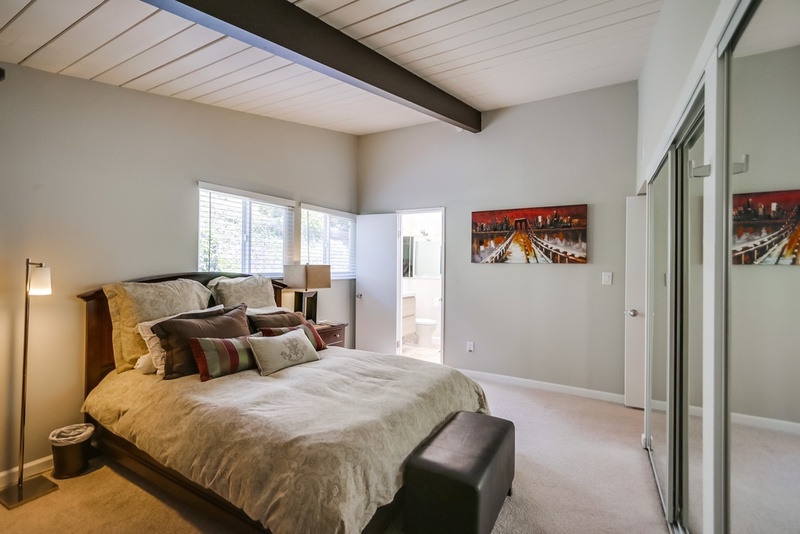 The second bedroom sits next to the den, and gains natural light through a small light well. 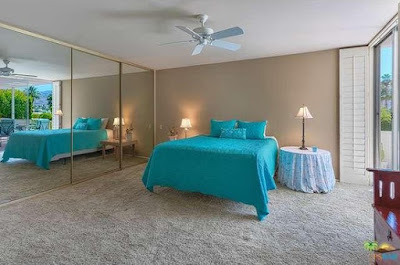 The master bedroom sits at the back of the unit, and features a sliding glass door to the back patio area and a full wall of mirrored closet space. 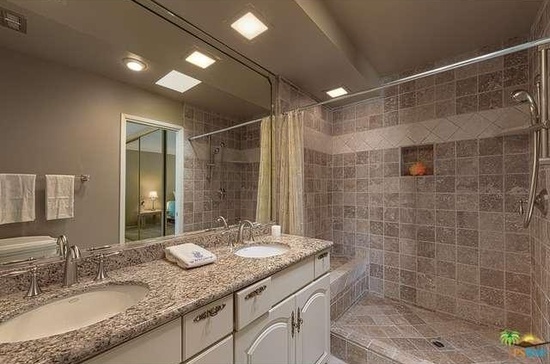 The master bath features a large step-in shower, and stone tile accents. 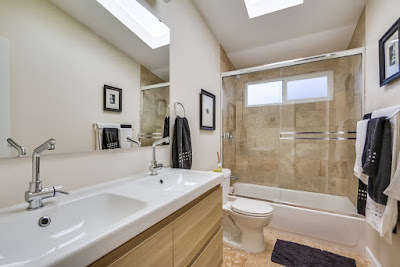 The hall bath features a standard tub, stone tile accents, skylight and granite vanity counter tops. 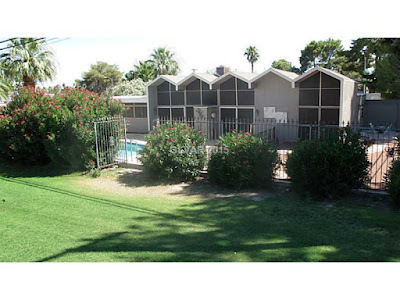 The patio runs the length of the living and dining rooms and holds enough space for outdoor entertaining and relaxing. Shrubs within the common area offer privacy, while small succulents offer greenery on the interor of the patio. There’s also a built-in bench off to the side. This is a pretty neat condo that may not be mid-century modern on the inside, but definitely has great lines, a great floor plan, is in great shape and move-in ready. 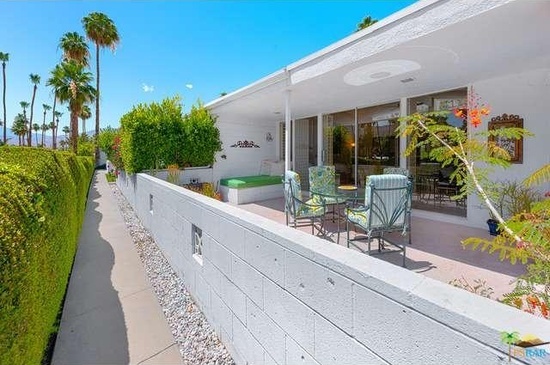 Priced at only $80,000 is this 1959 Palmer & Krisel-designed home in Tucson, Arizona. 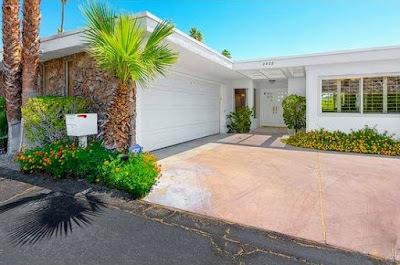 This is the lowest priced Palmer & Krisel-designed home on the market in the country right now, and a great opportunity for a new owner to bring this home back to its mid-century beauty. 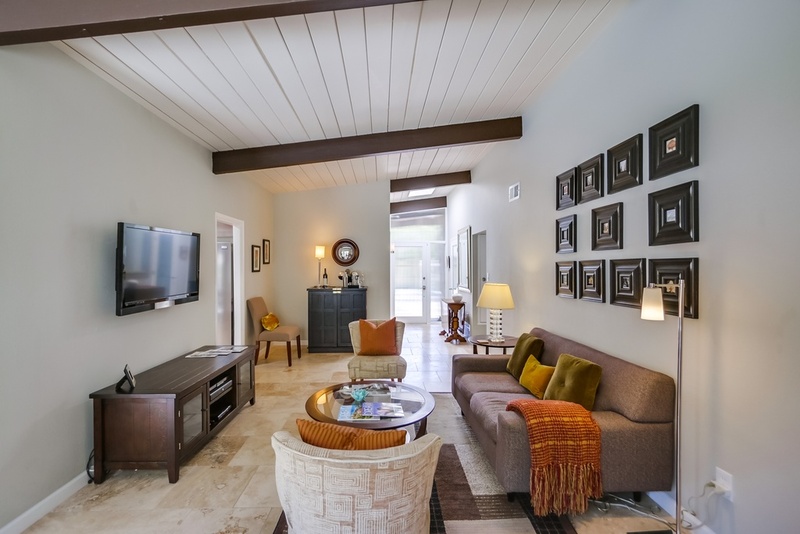 This 1,416 square-foot home features three bedrooms, two bathrooms and a two-car carport on an 8,000 square-foot lot in the Casas Adobes area of town. Every square inch of this block-constructed home needs attention. It’s rough all around. There’s no real landscape, front or back. 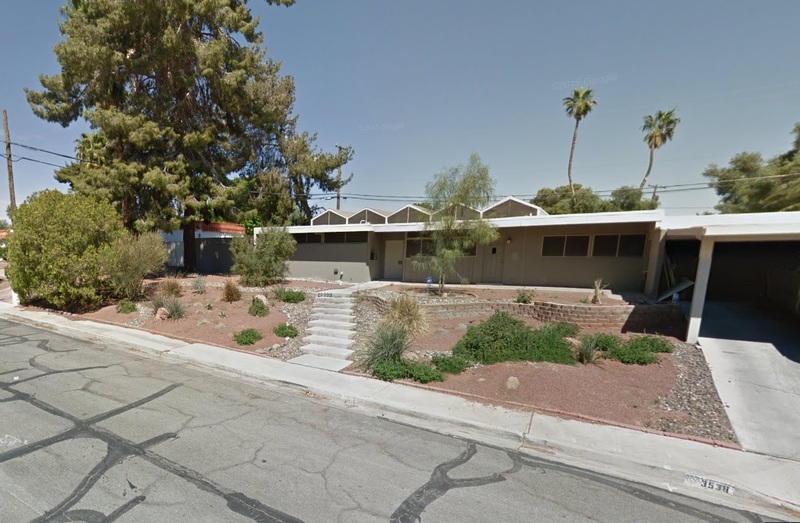 There’s not even a driveway, but that’s not that uncommon for Tucson. The exterior of the home exudes classic Krisel design, with high bands of windows, clerestories on the ends of the home, and double carport supports. Unlike most Palmer & Krisel homes, this subdivision was built with block construction, rather than the typical post and beam. The living, kitchen and family rooms are all at the rear of the home, while the master and secondary bedrooms are at the front. 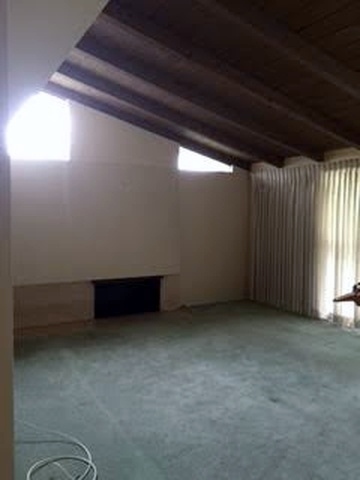 The living room features a prominent concrete block fireplace, signature Krisel clerestories and vaulted ceilings. 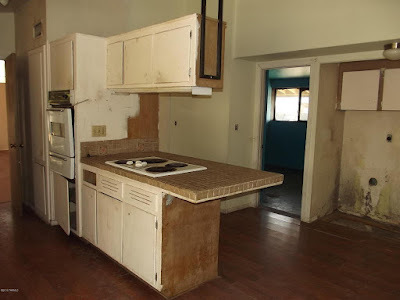 The Kitchen looks pretty rough – the original cabinets are all still in place, but very well worn. These could definitely be sanded and restored back to original shape, but not without effort. 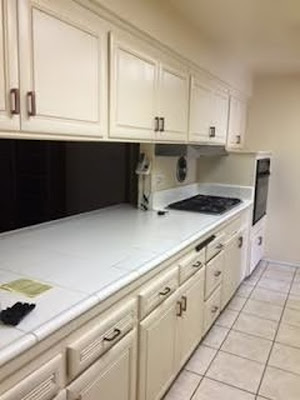 The appliances and counters aren’t original to the home, and all look like they need o be addressed. 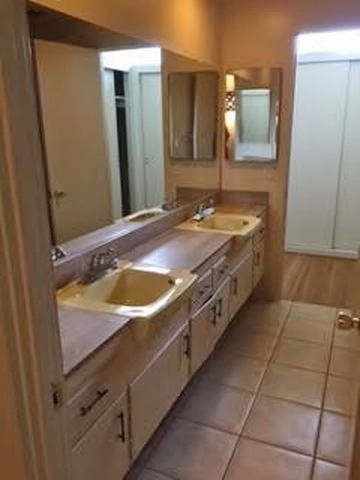 The master bathroom features the original sink, cabinetry, mirror and medicine cabinets, with mid-century saucer pulls, and was built jack-and-jill style, with access to the entry hall and the bedroom. The countertop and tilework in the stall shower are not original to the home. The secondary bathroom sits between the secondary bedrooms jack-and-jill style, and is pretty rough shape, with no original features left. 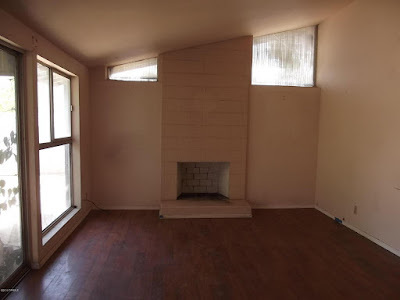 The listing agent does not appear to be aware of the architectural background of this home, and is unfortunately marketing this home to investors rather than restorationists or architectural buffs. 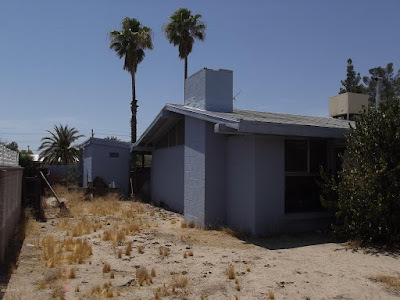 It definitely needs lots of work, but we know how fantastic these homes can shine if they’re brought back to their modernist roots. 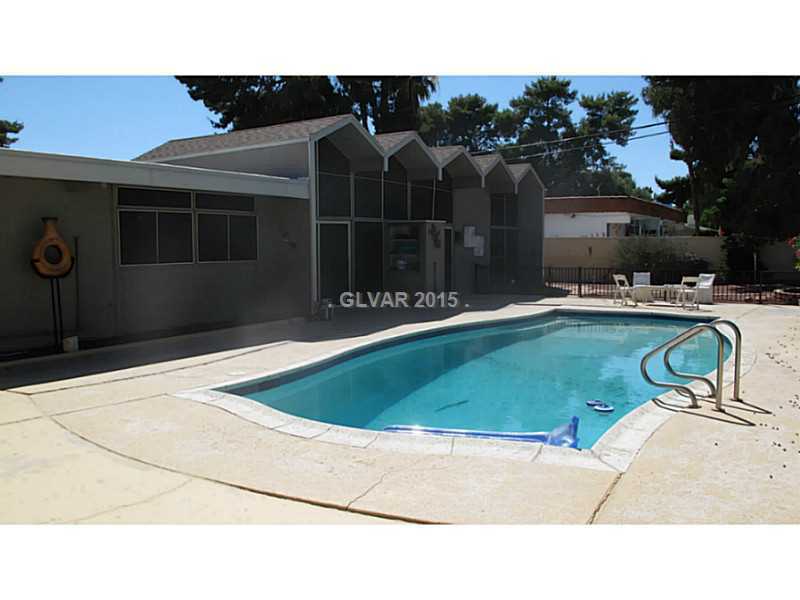 Brand new to the market is the 1963 folded-plate roof Palmer & Krisel designed home on the 12th green of the Las Vegas National Golf Club. 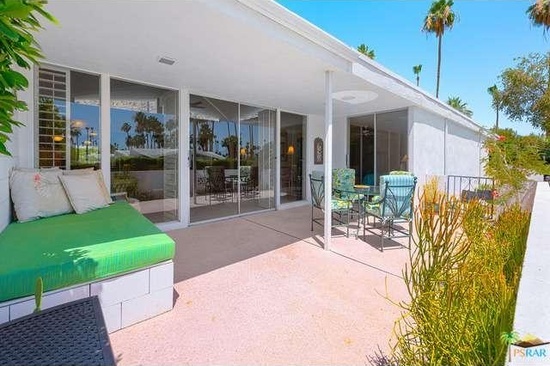 Once the retirement home of mid-century entertainment duo Peter Lind Hayes and Mary Healy, this home features four bedrooms and two bathrooms with a two-car carport on a 10,400 square-foot lot with an asking price of $340,000. This is a rare Model 12A, with just a handful built in the community. The home has been completely remodeled, and with the exception of a garage conversion, generally retains its original floorplan. The front of the home is painted a subdued monochromatic gray, and features a low care desert front yard. Walking into the home, one enters the great living and dining room area, which features that fantastic folded plate ceiling with clerestories at each end. The rooms are divided by a signature Krisel fireplace, which still retains its original form. Of course there’s the standard walls of glass overlooking the backyard, swimming pool, and Las Vegas National Golf Club. The kitchen has been renovated, and is open to the dining area, and features granite counters, and relatively simple, cherry wood cabinets and allows for views to the front yard and street. The bathrooms have been updated, with the hall bathroom featuring travertine counters, walls and tub surround. The master bathroom has been updated to include euro-style tile, travertine coutners, and a large glass step-in shower. The backyard has been kept relatively simple, centered around a large in-ground pool. There’s lots of red gravel and few plants, making the green of the adjacent golf course seem that much more appealing. 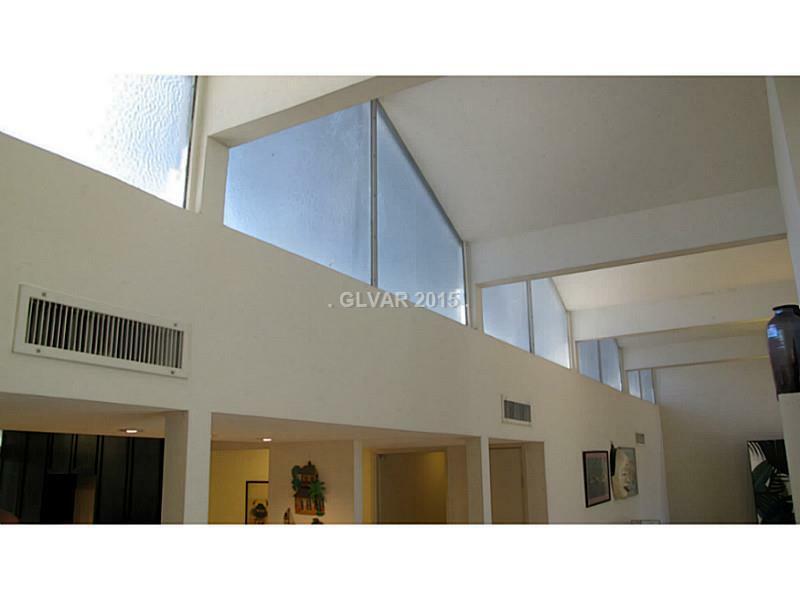 This is definitely a fantastic property that was an ultra luxury mid-mod showplace at the time it was built. With a few minor tweaks, this home could shine even brighter and become a stellar example of mid century modern. Looking for that perfect vintage retro Palmer & Krisel in the San Fernando Valley? 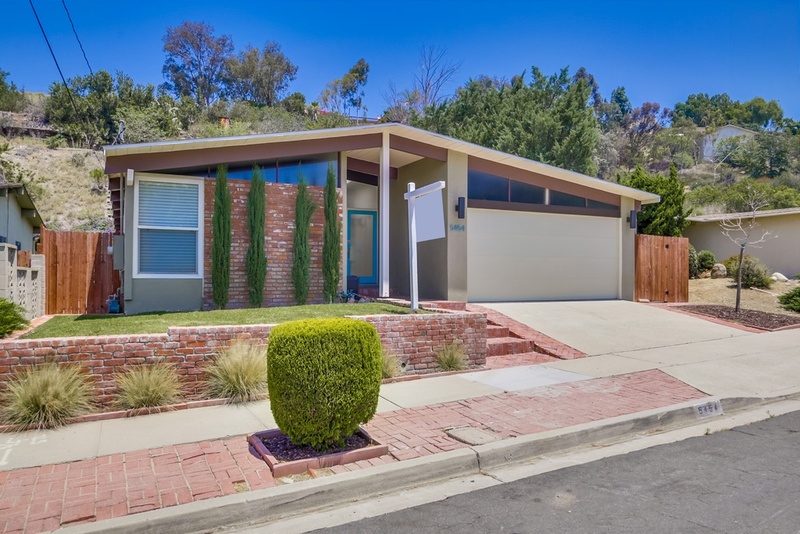 Here’s a well-kept 1959 mid-century Palmer & Krisel with original kitchen and baths on a huge 11,100 square-foot lot in Northridge. This 1,720 square-foot home features four bedrooms, two bathrooms and a two garage with an asking price of $650,000. 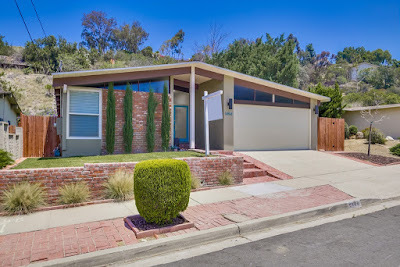 The front of the home features the quintessential mid-century look – a grassy front yard with a small hedgerow at the back of sidewalk. The windows have been updated with mullioned white vinyl sliders, and the garage door has been updated with an English-cottage style door. Adjacent to the garage behind the three topiary shrubs is a walled-in service porch that provides access to the laundry area. 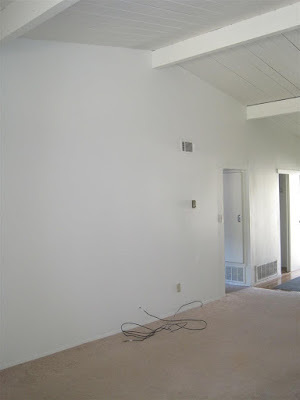 Check out the rock accent wall on the east corner of the home, giving it that perfect mid mod accent. Like many Krisels, the living area sits at the back of the home and is anchored with a signature fireplace, soaring open-beamed vaulted ceiling and clerestories flanking the chimney. 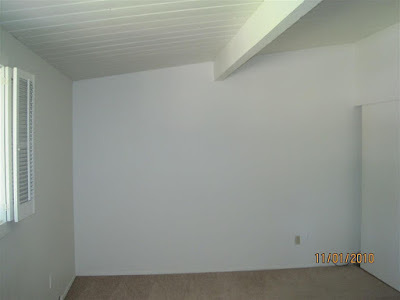 The back wall features those hallmark glass walls, shielded with classic wall-to-wall drapes. 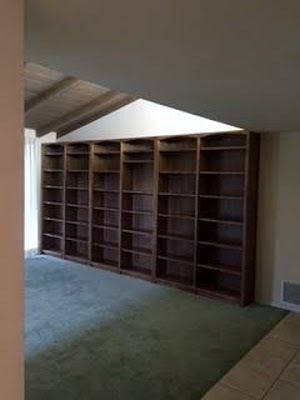 The dining room sits at the west end of the living room, and features a large built-in bookshelf. 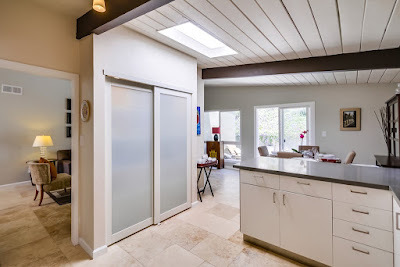 Joining the two rooms together, out of view in most of the photographs, is a large floating soffit that serves as the lighting element for the space. 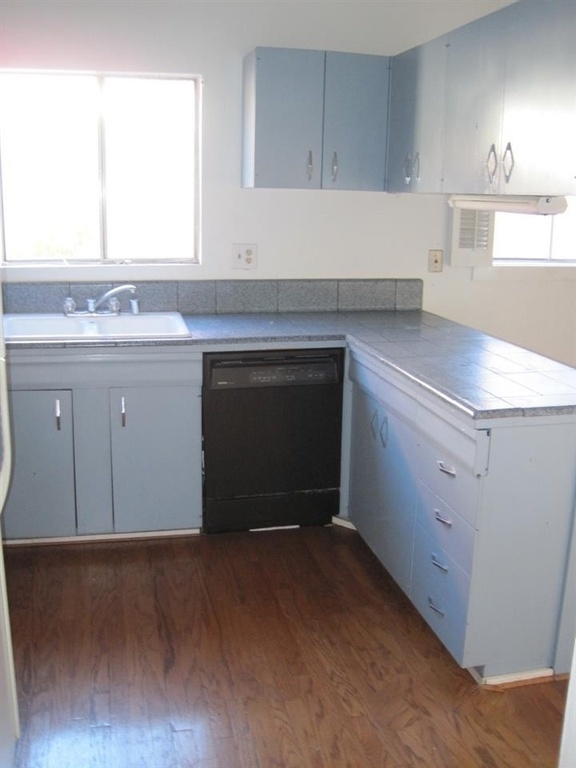 The kitchen features its original cabinetry and large white tile countertops. The original sink is still in place, outlined with a classic chrome band. 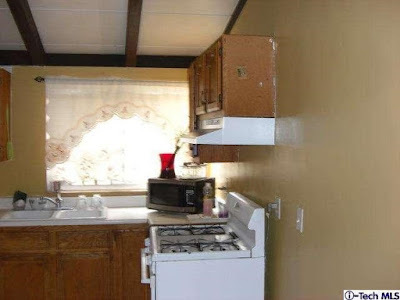 The appliances have been updated, but the original wall-mounted over housing is still in place, along with the classic wall-mounted range fan. If outfitted with retro appliances, and the perfect mid-century-inspired floors, this kitchen would be that perfect mid-mod showcase. The master bathroom feature original cabinetry, counters and yellow American-standard sinks – a rare color as many Krisels tended to feature white Pullmans. The hall bath is another great time capsule, with original cabinets, counters and pink American Standard sink – this is the first original pink sink I’ve seen in a Krisel- wowee! 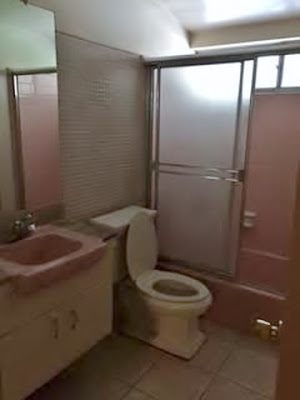 The tub and tile surround are also original 1959 pink – so neat to see this still intact and well-cared for. The bedrooms feature original clerestories and vaulted ceilings, and like with many older homes, this one features a myriad of flooring, including ceramic tile, carpeting and laminate flooring. 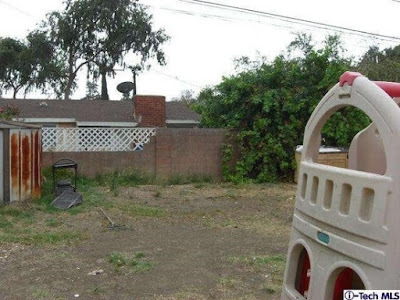 There’s no photos of the backyard, but Google maps show it to be fairly large, with a concrete patio at the southwest corner, plenty of grass and a tall green privacy hedge wall. We hope the new owner loves this home as much as it appears the previous owners loved it – this will definitely a fantastic atomic ranch, with lots of potential around every corner. 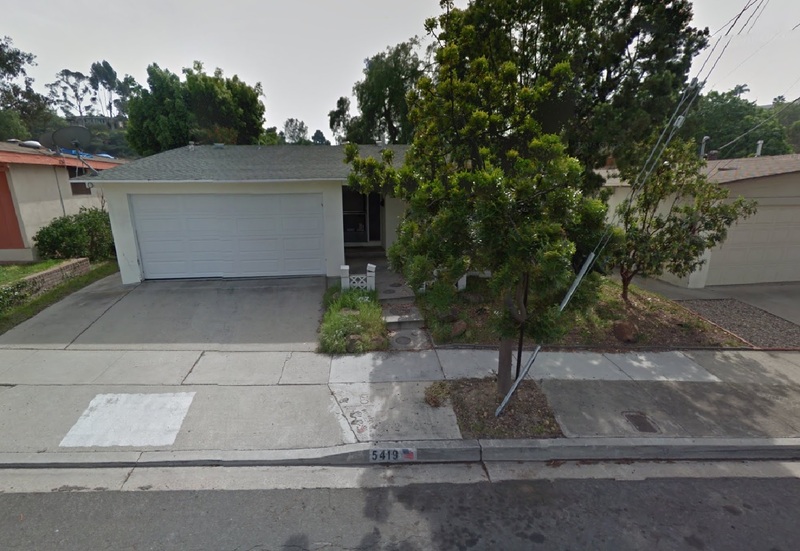 There’s another well-worn Palmer & Krisel home for sale in Pomona’s Valwood Estates neighborhood. 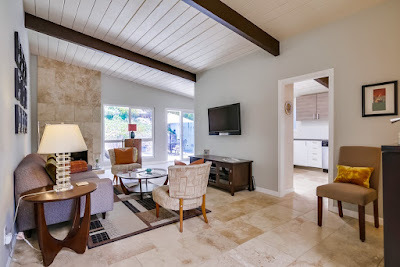 This particular home is 1,200 square feet Valwood Estates Model F4, built in 1955 featuring three bedrooms, two bathrooms and a detached two-car garage on a 5,900 square-foot lot, with an asking price of $330,000. The front exterior has been freshly painted, and unlike many Valwood Estates homes there’s no wall or fence enclosing the front yard. The floor to ceiling master bedroom windows out front have been recently replaced with mullioned white vinyl windows that no longer extend the full height of the wall. Most likely a quick and inexpensive solution for window replacement. Inside, the home is a busy mix of colors, wall textures, tile and crown molding. The interior appears to retain the original layout, with the exception of the conversion of the fourth bedroom to a dining room at the front of the house. 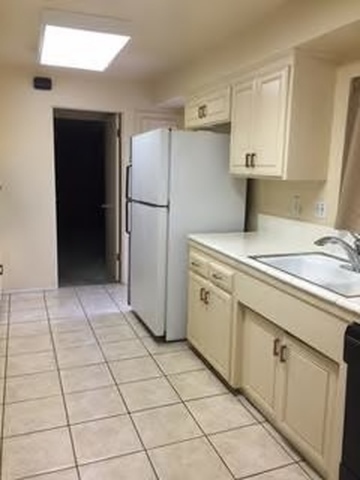 The original living room and kitchen are at the back of the home. 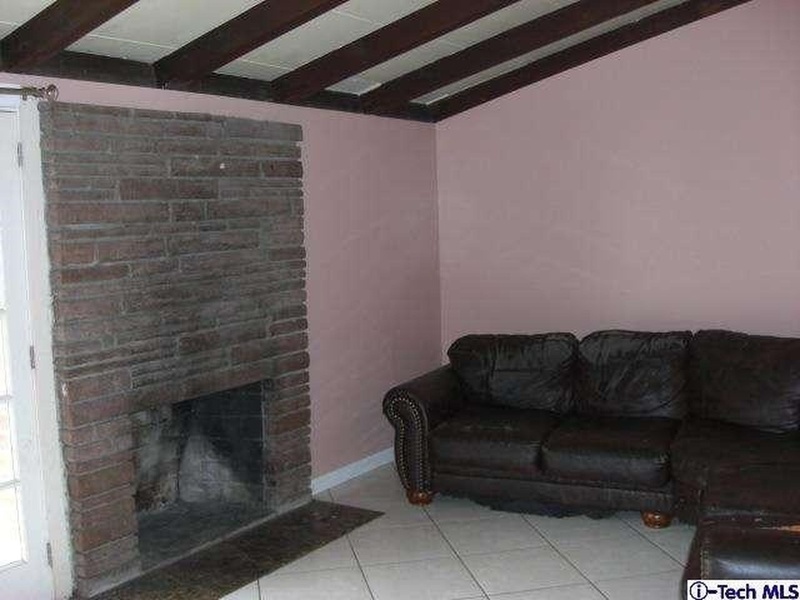 The signature walls of glass have been replaced with French doors, and the fireplace appears to have been well-used over the years. 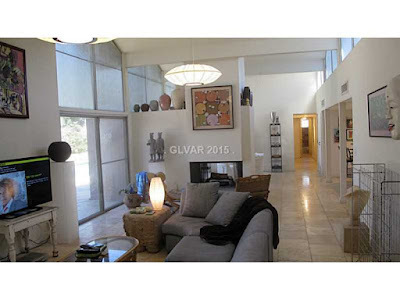 The open-beamed vaulted ceilings are still intact, as are the clerestories at the sides of the home. 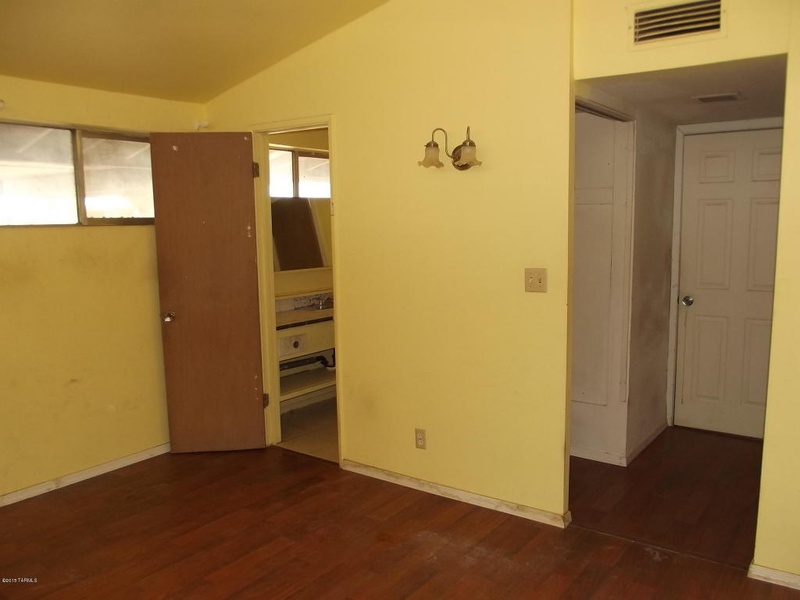 There’s not much original left, with the exception of some of the closet doors and a pantry next to the refrigerator. The remainder of the kitchen appears to have been updated with oak cabinetry and basic appliances. 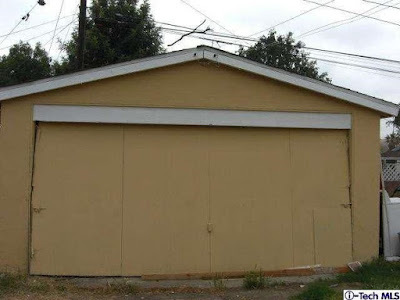 The backyard is a blank slate, with a myriad of fencing types, and houses the original garage which appears to have suffered from some deferred maintenance. The listing states that there’s lots of potential with this home, and that’s true. We know how great Palmer & Krisels shine when restored, and this one is definitely a great candidate to be brought back to life. 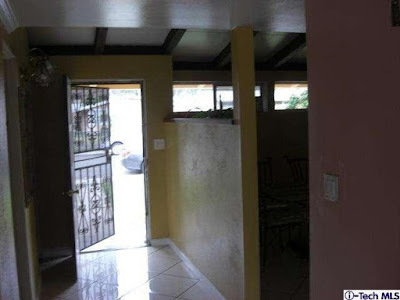 The listing agent didn't put much effort into the photographs, and there's plenty of blurry and odd detail shots to look out. Here’s a contrasting property to yesterday’s original 1959 Palmer & Krisel in College Glen Estates. This Palmer & Krisel was built by the Drogin Construction Company in 1960 and features four bedrooms, two bathrooms and a two-car garage in 1,492 square feet on a 6,300 square-foot lot with an asking price of $545,000. This home is in move-in ready condition. 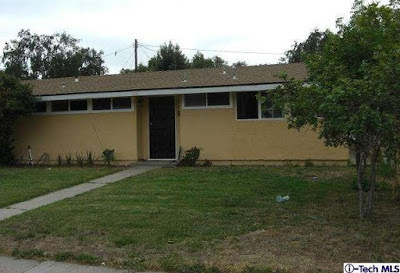 The façade of the home features original clerestories both at the front bedroom and above the garage; other windows have been replaced with white vinyl, and the double-hung window on the front of the home replaces what would have been a more signature (and stylistically better) four-pane window. The front door and sidelights are opaque glass, and offers a spot of color. 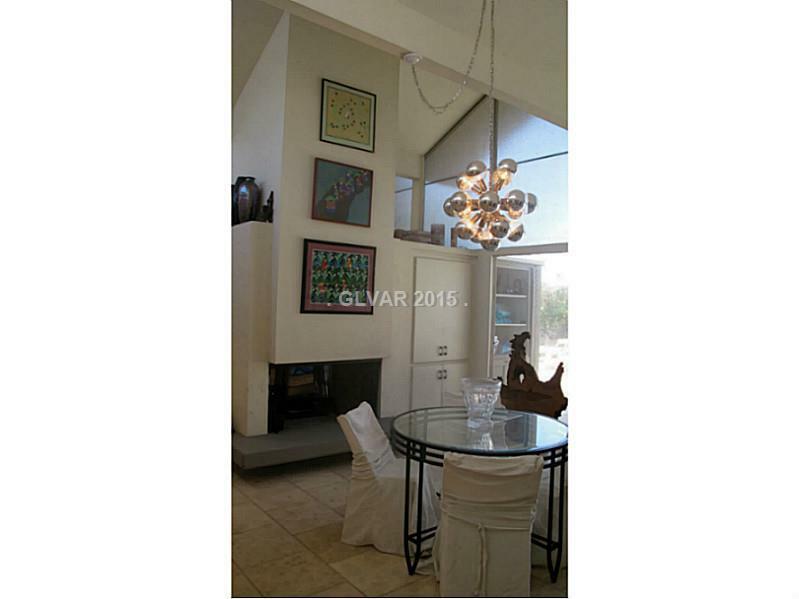 Sleek address numbers and light fixtures help set the modern tone for this home. The interior features travertine flooring throughout, and has even replaced the signature Krisel fireplace massing. The interior walls are painted a warm grey, and are complimented with white and brown open beamed ceilings. As with many Krisels, the living area provides views to the backyard, and the kitchen is tucked off the entry and dining area. 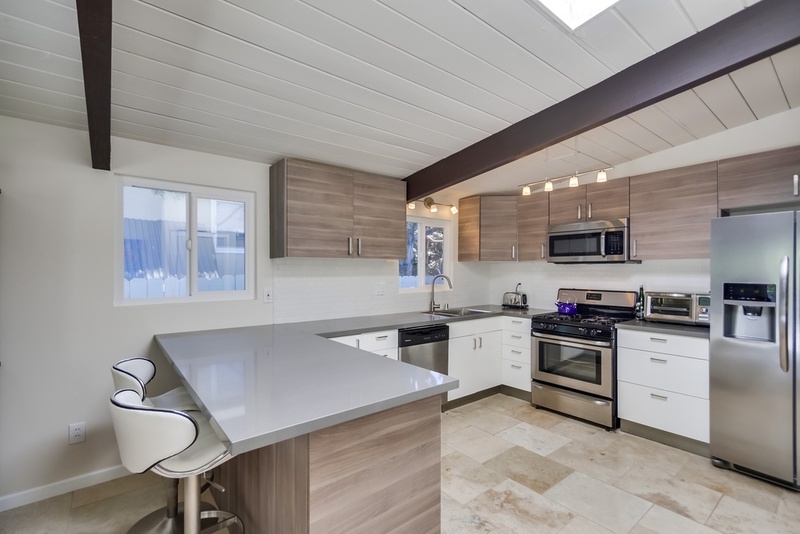 The kitchen has been sleekly remodeled, utilizing the most current trends in cabinetry and counters. 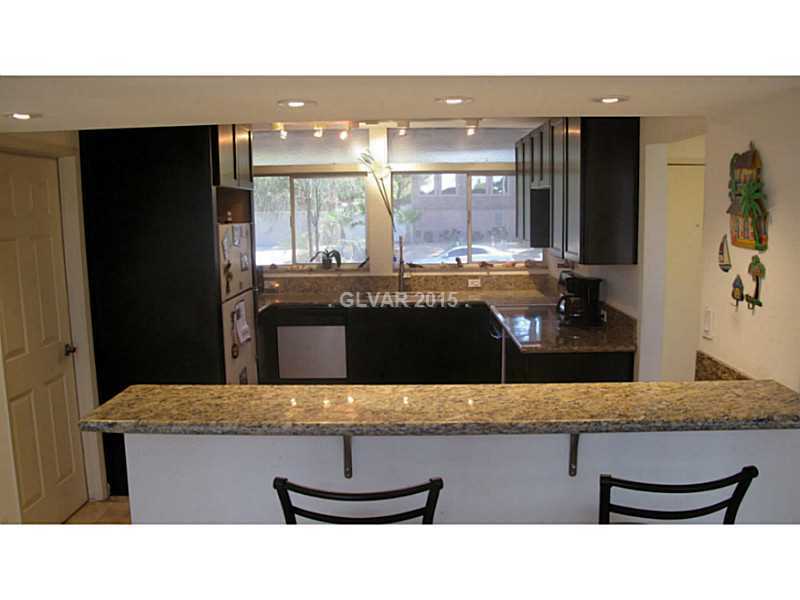 The lower cabinets are white while the uppers are euro-style wood grain, with grey composite counters. The look is a little top-heavy, but definitely on trend. The bedrooms all show clean, open and bright, and the bathrooms have been renovated in a style that compliments the updates throughout the home. Once again the ever-popular Ikea Godmorgon bathroom vanities are featured in the bathrooms, like we’ve seen countless other updated Krisels. 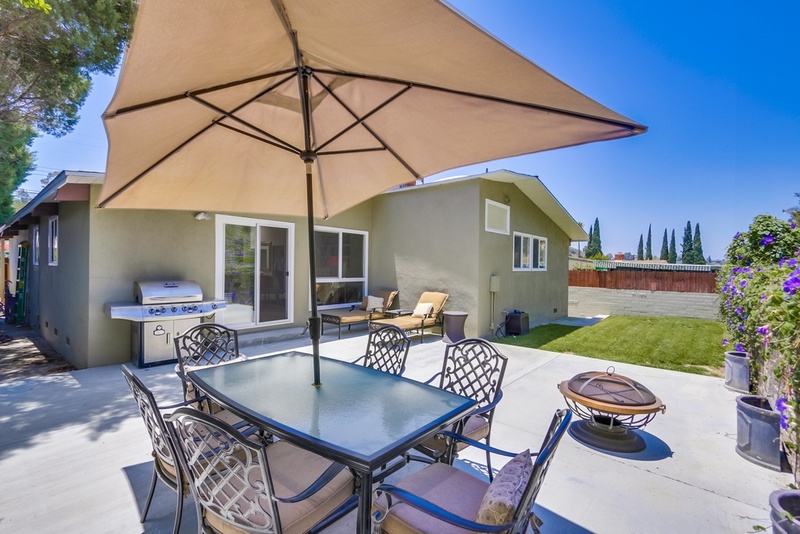 The backyard is fairly shallow, as it backs up to a hillside, and offers a small patio and turf area. We only spotted one tree on this property, and that’s in the front yard, meaning there’s ample opportunity to add in some greenery. 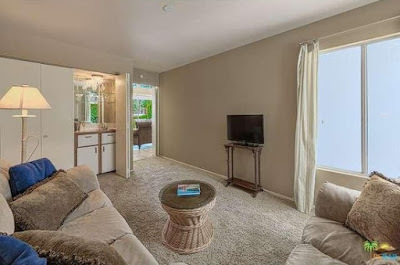 If you’re looking for a clean and crisp move-in ready Krisel in San Diego, look no further than this home. It shows like a model, and would only need a few minor restorative tweaks to make it that perfect showplace. There’s no million dollar Krisels today, but here’s something just a special. 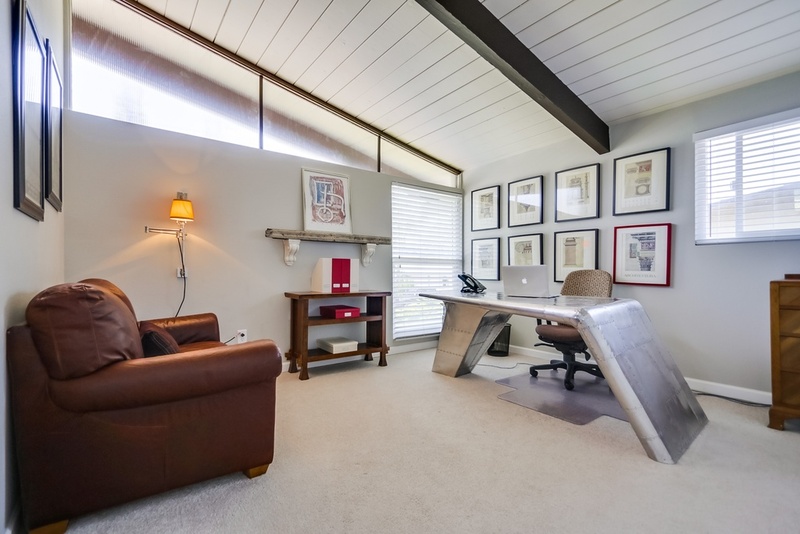 A vintage 1959 Palmer & Krisel-designed home for sale in San Diego’s College Glen Estates neighborhood. This 1959 home features four bedrooms and two bathrooms in 1,492 square feet, all on a 8,300 square-foot lot that backs up to a small natural area. There aren’t many images of this home posted – it’s difficult to photograph as there’s a power pole and pair of trees in front of the residence – but what is posted gives a great glimpse into a pretty original home. Unlike most of the other homes on this street, this home features it’s gables on the sides rather than the front, making this elevation fairly unique. 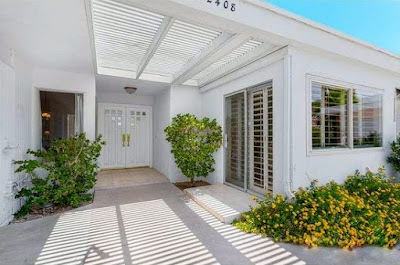 There’s a small porch in the front yard, and a somewhat random wall, making this home the perfect candidate for a modernist front yard makeover. We don’t have many shots of the living area other than a small shot taken of the glass wall overlooking the shady backyard. The real treat is what can be seen of the kitchen – it appears to be nearly all original. 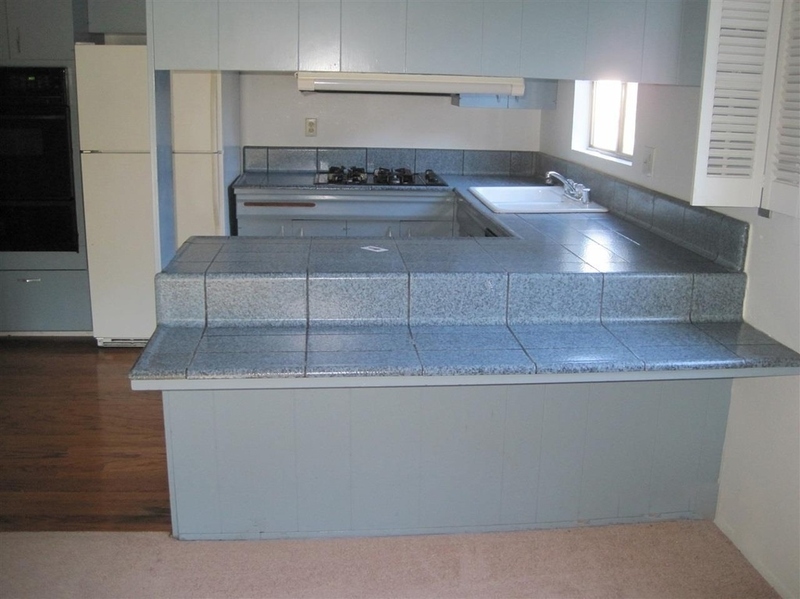 The counters are original blue-speckled tiles – the same tiles that were used on countless Krisel-designed homes across the west. The cabinetry is painted a matching blue color and appears to have original pulls. 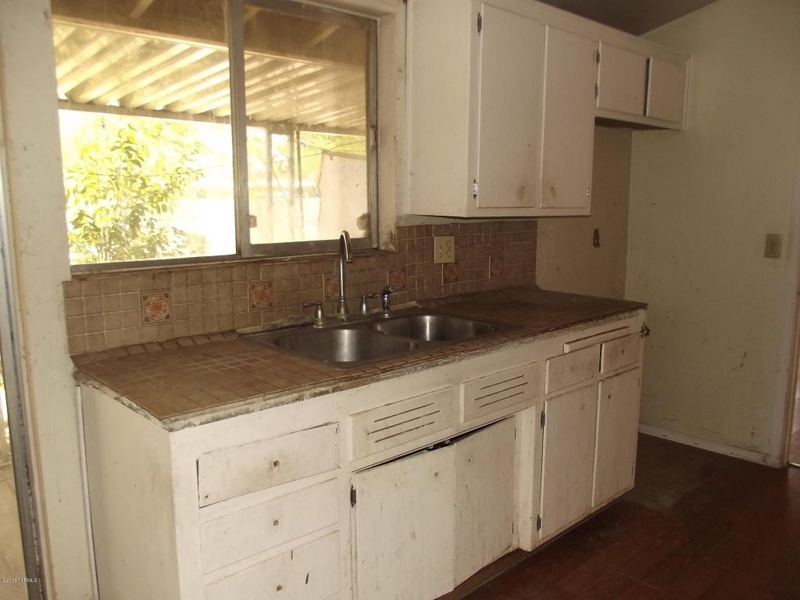 The appliances and sink have all been updated over time, however tracking down vintage appliances would definitely make this kitchen a retro show-stopper. The bedrooms and living areas all appear to have the open-beamed vaulted tongue and groove ceilings, helping to make this home feel more spacious. The doors and windows have also been updated with white vinyl – not the most fitting choice for the home but more energy efficient than the original aluminum framed windows. 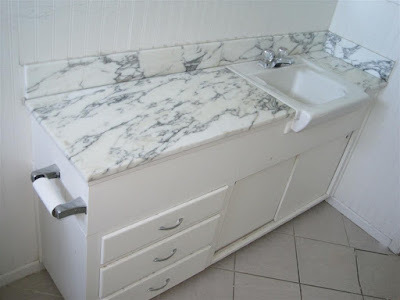 The bathroom has the original vanity, with marble counter and classic white American-Standard Pullman. 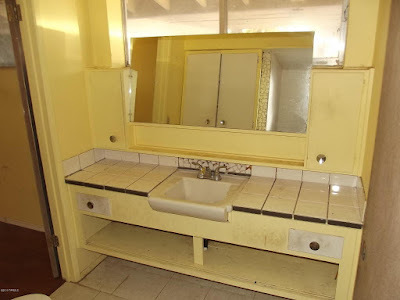 We love the sliding door panels under the sink – such a neat vintage feature. This is such a neat vintage home that could use a little TLC. The listing agent understands that this is a ‘modern-style home’ but goes on to note that it ‘could use a little updating.’ We’d hate to see that kitchen or bath go!